Recently I stumbled over some Colouraplast (available here*) I still had left over from a previous melted beads craft. That’s some kind of plastic granule you can melt in your oven. I realize this special brand might be hard to get by some of you, but you can do the same thing with these pony beads (available here*) or perler beads . Just use beads that are transparent! If you have Colouraplast (available here*), you are ready to go! But you can also use these transparent pony beads (available here*) or just some old beads you have rolling around at home. I’ve also seen some crafts with melted perlers. Then you’ll need an old cookie sheet or a metal plate to melt the beads on. A round cake pan will work best. It should be something heat resistant without texture. You could also use a muffin pan for smaller sun discs. Pour the beads in the pan, and try to arrange them in a nice pattern. I went for a sun-like theme and arranged the yellow beads in the middle and lined them with some orange and red ones. For the outer egde I chose blue beads and sprinkled a few green ones on top. Your plate should be completely covered with beads. There should at least be two or three layers of them, otherwise the sun disc will be to thin and break. The volume of the beads decreases a lot once they melt. Put your plate in the oven and set it to 374°F or 190°C and let your beads melt. You should have melted beads in 20 – 30 minutes. Just keep checking the oven from time to time. And yes, it will smell a little funny! Colouraplast is non toxic, but I recommend to open the windows nonetheless. Little trick: Put a glass with some water and vinegar in the oven while your beads are melting. It will absorb most of the smell. 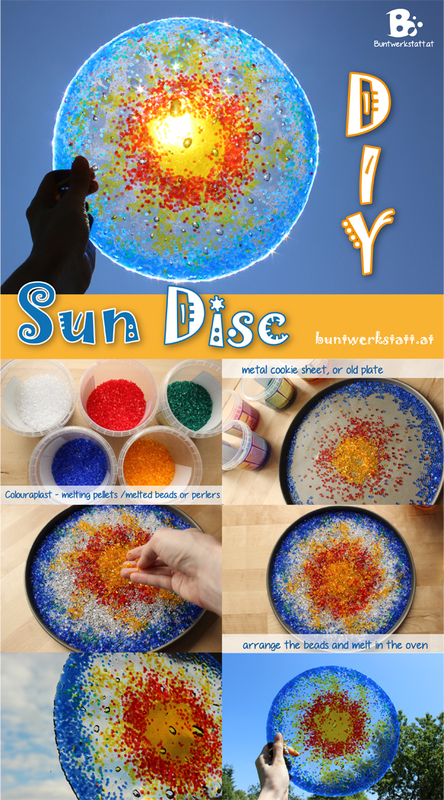 If your sun disc turned out to thin, you can sprinkle some more beads on top and melt it again! After your beads have melted down properly, just let it cool down for a while. You will hear some cracking sounds, but that’s totally normal. Your sun disc should come off your plate easily. If not, just turn it over and tap gently on the bottom. You can always melt it down again, if it breaks. But that should not be the case if you have used enough beads.